THE CLUB is a unique after school club for middle school and high school students. 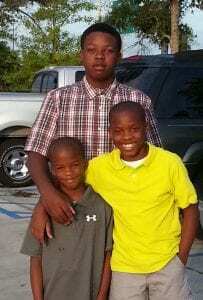 Club Members and brothers, Jaibrion, Joshua and Jeremiah, are leading an effort to help the youth and teens in Houston. Myrtle Beach is no stranger to Hurricanes and Natural Disasters. As brothers, we know the importance of family and staying strong. That is why we want to help our neighbors in Houston. Our community in Myrtle Beach gives to us every day through our Boys & Girls Club, our Church and our Schools, so we want to give back by helping other youth and teens. Please help us by donating a NEW pair of sneakers, NEW tee shirts or NEW under garments for youth and teens–all sizes. Together we can help one another keep moving forward one step at a time.